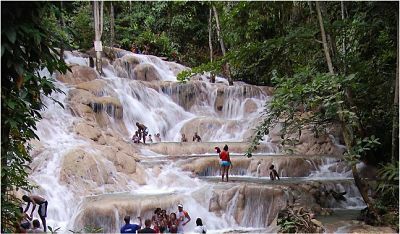 Home :: Jamaica Tours :: Montego Bay Tours :: Dunn's River Falls, Martha Brae Rafting & Shopping Tour MoBay. Dunn's River Falls, Martha Brae Rafting & Shopping Tour MoBay. Come on a journey with us for Rafting on the Martha Brae, is the island’s #1 rafting attraction, stroll through “Miss Martha’s Herb Garden”, a presentation of Jamaica’s herbs famous for their medicinal and healing properties. Rafting on the Martha Brae boasts a complement of eighty five experienced raft captains and thirty-foot long bamboo rafts, the raft ride is over a three mile stretch of the beautiful Martha Brae River and lasts approximately one hour. Then take a trip to the famous Dunn's River Falls, the most popular adventure in Jamaica, Dunn's River Falls is one of the most exciting experiences you will never forget, journey on the north coast of the Island on the shore line in our fully air-conditioned and luxurious vehicle, this breathtaking cascading falls that refreshes the mind, body and spirit of our visitors of all ages, your professional tour guide is very friendly, knowledgeable and ensures your comfort, safety and enjoyment on your trip. Ask a question about the Dunn's River Falls, Martha Brae Rafting & Shopping Tour MoBay.